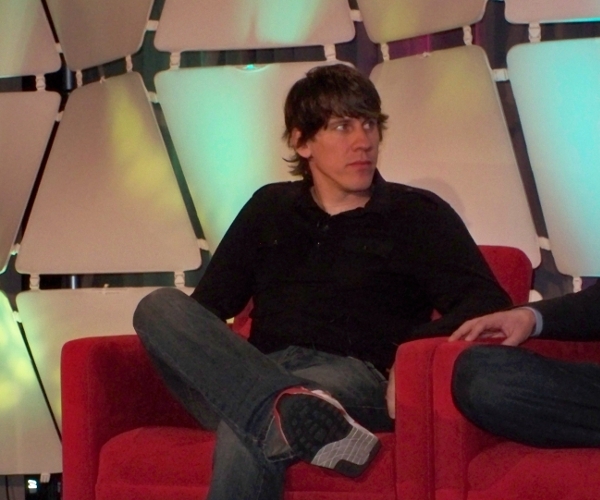 Foursquare's Crowley on Google social: "We've seen some of the stuff they're thinking about"
Foursquare co-founder and CEO Dennis Crowley sat down with Bloomberg TV today for a five minute interview and had a number of interesting quotes, including his thoughts on why Dodgeball at Google failed, how Foursquare is different from Facebook Places, why Foursquare didn’t sell, and most intriguingly, what he knows about Google’s social efforts. When asked whether location based services will hit the mainstream Crowley predictably said, “Oh sure, I think that location based services have the potential to be even bigger than some of the social networking tools that we use now.” Bloomberg flashed some previously know stats up on the screen (4 million users, 1.5 million check-ins per day, 15-20,000 new users per day) to back up Crowley’s point. One of the really interesting things about Foursquare is that we’re designed from the ground up to be all about location, all about helping people discover things in the real world and I think that really shows in a lot of the things that we build. I think Foursquare takes a little more fun and playful tone and we have a lot of social utility built into the product. The Dodgeball stuff just seems to be Google at the wrong time. The phones weren’t very mature,it was before social networks really took off, before things like Twitter and Facebook really came about. I think just the timing is different for Foursquare this time around. We all have phones with GPS, we all know how to use a lot of these social media tools – it just seems like the timing is right. We’ve seem some of the stuff that they [Google] are thinking about, and they’re working on some new stuff, it’ll be interesting to see how a lot of that stuff evolves. So what has Crowley and his team seen? It would be pretty surprising if it was in any way in competition with Foursquare, so we’re guessing they haven’t seen any location stuff (though it’s not completely out of the realm of possibility), but whatever it is, we’re guessing that Google has shown them for possibly a couple of reasons – either they want Foursquare’s opinion and/or they want Foursquare to be integrated into whatever it is Google has shown Foursquare (call it Google Me if you wish). Extremely interesting. We’re on a great ride, and it’s a little too early to get off of it.